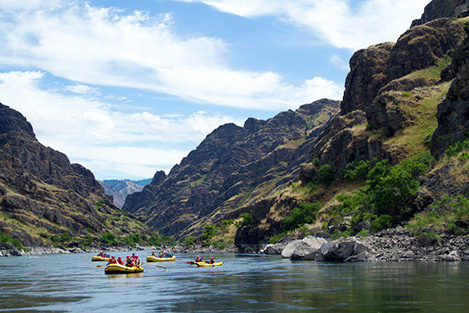 It’s called Hells Canyon, but the nearly 100-mile section of the Snake River that wriggles through North America’s deepest gorge is definitely a generous slice of heaven. I had seen snippets of Hells Canyon from high above, but a five-day rafting, kayaking trip provided a water ouzel-eyed view of the river that’s mostly inaccessible by road. It didn’t hurt that the trip included a geologist-anthropologist well versed in the canyon’s cultural history, a chef who prepared sumptuous gourmet appetizers and dinners, and the owner-winemaker of a boutique winery who provided nightly commentary and generous samples. It was promoted as a wine tasting trip, but I found myself intoxicated by the sights and sounds, from the river’s raw, rugged setting to the morning trills of canyon wrens. Getting from the meeting place in Idaho’s Lewiston to the put-in site below the Hells Canyon Dam was a trip itself, literally and physically. Our group of 14, along with two of the eight staff from our outfitter OARS, flew an hour from Lewiston to the Oregon community of Halfway in three small aircraft, which provided views of the Snake River and Wallowa Mountains, before landing — surprise — on a dirt airstrip. Less than an hour later, shuttle vans deposited us at our armada of ready-to-go rafts and inflatable kayaks. Things began quickly, with a pair of deceptively thumpy class 4 rapids, Wild Sheep and Granite, that made swimmers out of most of the paddlers in the bouncy inflatables, appropriately nicknamed “Duckies.” More — Waterspout, Rush Creek, Tyron, Wild Goose — would follow. Unusually, there was more than one way to travel the river. Along with the duckies, the most active way to travel the river, the options included a paddle raft, oar-powered rafts (where passengers did nothing more than enjoy the scenery) and a dory, a small, shallow draft boat that provided rodeo rides through large rapids. During the five river days, I tested all four. Whether paddling or sightseeing, there was much to enjoy. The canyon is gorgeous, sometimes with steep, narrow and towering walls, other times wider and broader. The Snake literally snakes a watery path with Oregon on its western flank and Idaho on its eastern side. Flowing north on our final day, Oregon eventually gave way to Washington. Traveling the Snake is traveling through history. The history of the Nez Perce and Shoshone-Bannock tribes is remembered at places like Battle Creek, where the tribes fought, and from the abundant but seldom seen pictographs and petroglyphs on canyon walls. The Snake also figures in the history of the Lewis and Clark expedition, gold miners, homesteaders and battles over controversial hydropower dams. With the help of Morris Uebelacker, a retired cultural anthropologist, each day’s travel was supplemented with side excursions. Some went to riverside Indian sites, others to the Kickwood Historic Ranch and Museum, a preserved homestead ranch. More sobering was the Deep Creek Massacre site, where outlaws murdered up to 34 Chinese miners in 1887. The best view was from the wow-inducing river overlook at Suicide Point. According to a legend that Uebelacker discredits, a heart-broken Nez Perce rode his horse off the cliff to their deaths. Good fortune allowed us to view fisheries biologists measuring and collecting data from a captured sturgeon, at 72 inches in length and weighing 94 pounds a relatively young, small fish for a species that can be 15 to 18 feet long and live more than a hundred years. Along the river we viewed a trio of deer with massive racks impassively watching us from the shade of a tree. Several times we saw bighorn sheep, including massive horned bucks lazing in the sun and, at a campsite, others grazing above on steep sloped walls. Probably best of all were the bald eagles, including one that flew less than 20 feet above us carrying a fish in its talons. At camp, chef Cristian Vargas prepared appetizers and dinners — the first night included ceviche followed by halibut in a shrimp sauce. Following nights included duck confit, slow-cooked and grilled lamb, steamed vegetables, marinated strip steaks and more. All four nights, with a satiated belly, I spent under the stars, waking to see a sky bulleted with millions of points of light. Traveling the Hells Canyon of the Snake River was a hellaciously great trip, on the river and off.